To get answers to our most frequently asked questions, click on any of the headings below. If you have question that isn’t listed here, please contact us. Individual classroom enrollment can change several times during the course of a year, or a classroom registration can remain constant. Please call the Director of Admissions at (949) 552-1967 for openings for your child. Are the Half Day Children and the Full Day children in the same classrooms? No, there are separate rooms and individual curriculum for each program. Is your program developmental or academic? What are the differences? Our program is a developmentally academic philosophy that is based on the fundamental principles of the growth of children. The emotional, physical, intellectual and spiritual stages of children occur in a predictable, orderly pattern. For example, throughout the world, children sit before they crawl, crawl before they walk, and walk before they run. However, the time sequence of these stages is unique to each child. In addition, each child has his/her individual style and rate of learning. Curriculum is developed as interests and ideas emerge from the children. Their investigations and research advance through the developmental stages at their own rate of growth. 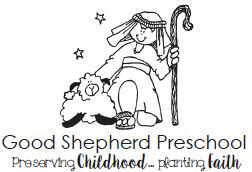 At Good Shepherd, children develop academic concepts (science, math, literacy, etc.) through these inquiries and studies. In small groups, various opportunities are provided to explore the many wonders of our world through “hands on” experiences utilizing the five senses. Is my child just going to be playing at preschool or will he/she be learning? Teachers participate in developing memorable Chapels. Bible stories, songs of praise and worship and prayer are an integral part of this special time. Children learn about God’s great love for them and the importance of knowing Jesus Christ. Language is encouraged through the use of dramatic play, blocks, creative art, stories, problem solving and social interactions. Small muscles necessary for writing are strengthened with fine motor activities such as scissors, play-dough, sign language, stringing beads, and pasting. Perceptual and conceptual development are improved with the use of science, puzzles, board games, finger-plays and books. Motor development enhances growth of large muscles with obstacle courses, balancing boards, and games with scooter boards and balls. Our music teacher brings songs and creative movement that develops listening skills, rhythm patterns and attention span. Are snacks and lunches provided? Nutritious, low sugar snacks are provided by the Preschool in accordance with the nutritional requirements set by the State of California. These snacks are served mid-morning and mid-afternoon and at 5:00 p.m. for children still at school. Snack calendars are posted on parent boards in each classroom. Parents provide the lunches for the Full Day children. We are a nut-free school!